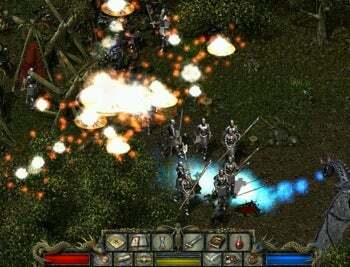 Better late than never, game reanimation gurus GOG.com have just re-released Larian Studios' Divine Divinity, one of the better action-RPGs to favor the early 2000s. Imagine Diablo with brains, or Ultima 8 minus the party and streamlined for speed and you're in the ballpark. The world (designated 'Rivellon') comes flush with little details, from knives and candles and scraps of scribbled-on paper stacked on tabletops to witty epitaphs scrawled on tombstones and hundreds of interactive characters with distinctive personas and histories. Terry Prachett's daughter stepped in to craft the 31-page prologue (downloadable with the GOG version) that fleshed out the cosmic backstory, a backstory the game would go on to reference frequently. Your vocational choices included warrior, wizard, or survivor, the latter being equivalent to a rogue of sorts. Character stats were genre-friendly: Strength, agility, intelligence, and constitution, each functioning as anyone with a degree in D&D might expect. Some 90 unlockable skills offered alternate ways to kit out your character, some favoring close-up tactics, others ranged or magic-based, others still rewarding surreptitious behavior by way of backstabbing and trap-building. Health and mana were complemented by a stamina gauge that dictated physical activity, from the amount of time you could sprint without breaking, to special melee abilities that let you spin in place and strike multiple enemies. While the world bent over backwards to tell its story and furnish the curious with an elaborate mythos, combat skewed 'click-friendly'. Wading into battle tapping mouse buttons to trigger weapon strikes or fling spells was enough to get the job done, and single engagements rarely lasted more than a second or two. Enemies iterated in tiers, so for instance: Generic orcs, then orc archers, on up to orc drummers (orc magic-users capable of summoning more orcs). Enemies were on an equal footing with you tactically, either flinging themselves or various objects and spells at you. How much heavy lifting a situation required derived from an enemy's defense metrics and sheer hit points. Once you'd spooled up an attack, winning came down to minding health, mana, or stamina with relevant aids or potions. At the time, the designers attempted to convey the scope of the game world in terms of screens: 20,000, give or take, comprising four massive areas. What I saw of the game (I never actually finished it) was intimidating enough, easily the equal of contemporary sandbox sprawlers like Oblivion or Gothic 3. Obsessive-compulsive players could make a mini-game of flushing the black auto-map fog from unexplored areas by poking around the periphery and testing the visual engine's flexibility (quite flexible, in fact, until you hit the perimeters, edged with arbitrary clutches of impassable scrub or rock). The great thing about the GOG version is it's more than just reissue. You'd at this point expect a service like GOG to make the game DRM-free. You'd also expect modern OS compatibility like XP and Vista (though I've been trying to play on the 64-bit version of Windows 7 Home Premium, and even in XP compatibility mode it pauses and hitches frequently). You'd expect it cheap, and it is: Just six bucks. What you wouldn't expect, is the original developer to roll up its sleeves, dive back into the code, fix whatever's left to fix, and add high-def support. “GOG.com approaching us was also the perfect opportunity for us to address a couple of issues in the original game, and introduce support for higher resolutions," said Larian Studios CEO Swen Vincke in a press email. "I remember the release of Divine Divinity as if it was yesterday. We had no clue how people would react to the game and weren’t sure that our RPG mix was going to appeal. Then, suddenly we got bombarded with emails and forum reactions from people enjoying the game, and received award after award from the specialized press. It was a very rewarding time, and I look forward to see the reactions from the GOG.com audience." Larian's even added widescreen support, meaning you won't suffer 'aspect-bloat' if you pick a 16:9 or 16:10 format. While I'm having trouble getting Windows 7 to run it without stuttering, I can say it looks absolutely exquisite on my 1680 x 1050 LCD. It sounds like Beyond Divinity (not a sequel, but an even smarter RPG) will grace GOG's catalogue in the coming weeks for just $10. Divine Divinity's actual sequel, Divinity 2: Ego Draconis, should debut early next year.